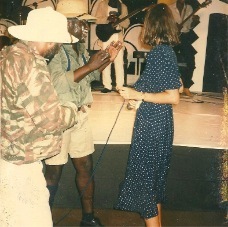 Emilio and Guy Dooh entertain a fan at a show in Strasbourg, France. 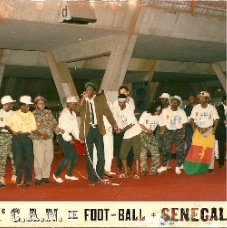 With Youssou N'Dour at the African Cup of Nations (CAN), Senegal, 1992. 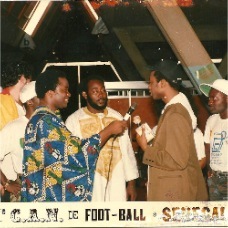 After the show with Youssou N'Dour, CAN, Senegal, 1992. 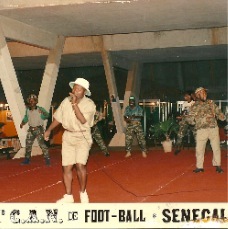 Emilio singing "Maloumba" at the opening show at CAN, 1992. 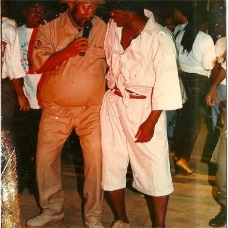 Guy and Emilio party with Zanzibar (out of frame), the late guitarist of Les Têtes Brulée. 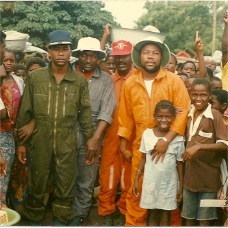 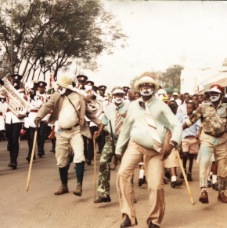 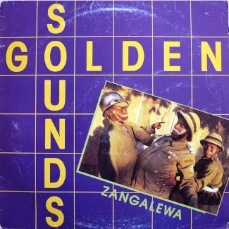 Jean-Paul Zé Bella, Emilio, Luc Eyebe, and Dooh on tour in Togo and Benin, 1990.